Since that time, I have wanted to read more of Betty Smith's words. And I finally did. Joy in the Morning wasn't A Tree Grows in Brooklyn. But I didn't expect it to be. And really, I didn't want it to be. The book begins on the morning of Carl and Annie's marriage. Annie had turned 18 on Wednesday, and so, against their mother's wishes (as well as the advice of the Dean of the law school), they decide not to waste any time and are married on Saturday--immediately after Annie arrives from Brooklyn on the night train. What follows is a recounting of their first two years of marriage: the ups and downs, the exciting and mundane. There are money problems (Carl still has two years left of law school, and he tries to work three jobs at the same time); they have dozens of arguments (some of them petty, others more substantial); Annie tries to find herself (she loves to read but only has an eighth-grade education); they find out they're expecting their first child (they didn't want any children until after law school, but once they find out, they're thrilled). In those two years, they're selfish and selfless; they grow in love; and in the end, they come out on top. When I wrote about A Tree Grows in Brooklyn, I said that it didn't have a gripping plot . . . unless you find human nature gripping (which I do). The same is true for Joy in the Morning. Nothing particularly exciting happens, but you get to peek in at the window of Carl and Annie's little house and see how they handle disappointment, ambition, passion, and stress, and it's completely fascinating. My initial impression of Carl was not flattering. Because the book drops you off at the cusp of Carl and Annie's marriage, you haven't yet spent any time getting to know them, and here they are, making a pretty big life decision. That afternoon, they are waiting to get into their little studio apartment, and Carl is having a difficult time keeping his passionate feelings subdued. All of a sudden something sets him off and he starts ripping off Annie's shirt while they're still sitting on the front porch. This was a mere twenty-five pages into the book, and I seriously thought, Who is this guy, and why in the world did Annie agree to marry him? But first impressions can be wrong, and in Carl's case, mine was. By the end of the book, I liked him so much. He proved to be hard-working, respectful, thoughtful, sweet, and tender. Once I knew the real Carl, the passionate porch scene didn't necessarily seem out of character but neither was it an overriding component of his personality. In fact, his most frequent request is for Annie to come sit on his lap and put her arms around his neck. Which, you have to admit, it pretty cute. "She wondered how the room would look to a stranger. She decided to test it. She went out, closing the door, and walked down the hall, then came back. Hand on the doorknob, she took a deep breath, closed her eyes, and walked in. She opened her eyes. The sunbeam on the glass ashtray threw off colored, shimmering glints. The bittersweet, duplicated in the mirror, seemed to fill the room with color. Her makeup things looked dainty--and the clock! With its short legs spraddled out, its shiny tin sides and honest open face, it seemed like an old friend. Annie sat on the bed, her hands clasped between her knees, and whispered, 'It's beautiful! It's just too beautiful!'" Besides being really sweet and uplifting, there were some darker undertones to the book as well. There are some hints to Annie being abused by her stepfather (which is part of the reason why she rushed to get married as soon as she was a legal adult). Also, both Carl's and Annie's mothers were initially opposed to the marriage and are still angry and unforgiving even by the end of the book. These were both themes that I think would have been more of a focal point if the book had been written today (because we seem to prefer books with issues). Earlier this month, I mentioned that Mike and I are on the brink of our 10-year wedding anniversary (by the time it actually happens in the spring, you all will be sick of hearing about it). Reading this book right now felt both poignant and sentimental as it surfaced all sorts of memories from our first year of marriage. Not unlike Carl and Annie, we were poor (but, "poor for something," as Annie so aptly put it), working multiple jobs, and trying to get through school. We lived in a tiny apartment, made some dear, long-lasting friendships, and tried to get used to the give-and-take of being married to another person. There were hard moments, but I think both of us would agree that we look back on that time with only fondness. 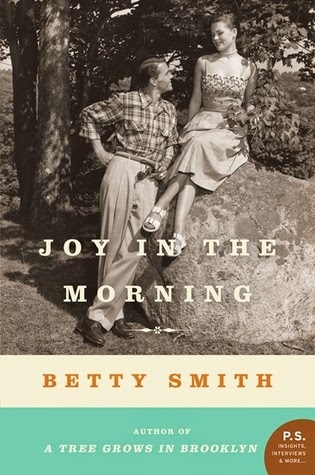 Betty Smith captures what that year is like with stunning and, at times, jolting candidness. Marriage is not endless bliss but neither is it eternal drudgery. It's a mix of the two. Annie and Carl made that discovery. And Mike and I made it, too. I've never heard of this one, but now you have me dying to read it!